Many customers assume that all wood floors should be coloured, and that it's a routine and simple part of floor restoration, just as easy as rolling a coat of paint on a wall. How we wish it were that easy! A stain is quite different from a 'finish' which is the generic term for any substance that can seal the porous surface of a wooden floor to provide a layer of protection and reflective sheen. Floor staining is difficult, meticulous work, often with unpredictable results as there are many variables that can make staining go wrong and when it does go wrong, the only solution is to re-sand the floor and start the process all over again. Success will also depend on what species of wood your floor is, because there are some timbers that don't take stain well. The particles of stain pigment have fewer places where they can wedge themselves if the grain is close together and not regularly spread. Soft timbers such as pine have the same variations in pore wall density, but the fibres of these coniferous timbers also contain resin or sap that will actively resist a wood-stain. Oak floors on the other hand, absorb stain more uniformly - but there is a difference between the density of early-wood and late-wood. Early wood or 'spring wood' is formed early in a year during spring season and is the most popular type available. It consists of xylem tissues with wider vessels and is less dense and not as strong as late wood. Late wood or 'autumn wood' is formed during the winter season. This consists of xylem elements with narrower vessels and being denser, it is stronger than early wood due to having a larger volume of wall materials. The staining product is made up of fairly large particles of colour which are known as "pigment". These pigments colour the wood by lodging in depressions and pores in the grain, but they will also seep into scratches and gouges that will accentuate the slightest imperfections such as marks left by a sanding machine which would be undetectable on a clear or naturally finished floor. The larger the cavity - the greater the amount of pigment that will end up there, and the darker and more opaque the cavity becomes. Pigmented stains will greatly help in protecting the wood substrate from lignin oxidation, but many timbers have more than one natural colouring in them - darks and lights, reds to greys, greens and yellows can all appear within the same wooden floor - especially a pine one! Spirit-based stains are compatible with both solvent and water-based lacquers. They have been used traditionally for many years but it is hard to achieve success with this difficult process which takes longer to carry out and obviously - more expensive due to the extra labour costs involved. We have experienced greater success lately with oil-based primers such as 'Polyx Tints' made by Osmo, and 'Pall X 333' made by Pallmann. These are made from natural products and can be over coated with rapid-drying two-component Hardwax Oils to complete the job much faster. We like to keep up with developments in chemical technology and will give any new products a try-out. The latest innovation from French company Blanchon called Aquateinte 2K, is a two component pure polyurethane water-based stain available in a choice of colours. This self-fixing odourless product dries quickly and can be coated directly with any type of finish including water-based lacquer or hard wax oil and we have used it successfully on pine floors. This product does the job in one application with a translucent effect that shows off the wood grain nicely. 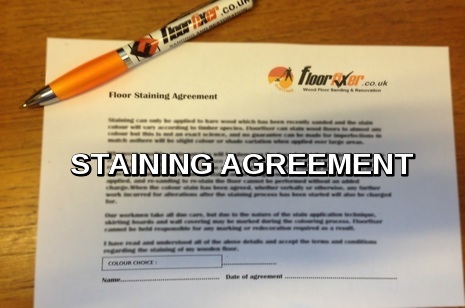 We apply several different sample colours to your floor for you to choose and then ask you to sign our 'Staining Agreement Form' (see below) before we start. The reason we do this instead of using colour charts is that stains do not all appear the same on different types of wood - and there's no going back after we have started. When a test is applied to your floor you will know exactly what colour it will be. If you change your mind afterwards, the floor will need to be sanded down to the bare wood again, and this would obviously add extra cost. Changing the colour of a wooden floor is a true art form. Floorfixer wood floor staining craftsmen follow a similar process which would be used by a French Polisher when producing stunning colours on furniture using a mixture of wood stain, tinted oils and waxes. The professional machinery used for sanding preparation must be top-of-the-range to achieve the end result required prior to the staining process. It also takes a great deal of skill to not leave any marks as evidence that a machine has actually passed over the floor. This is a skill that takes many hours of practice to master. We take a traditional approach when applying a spirit-based stain by hand, using rags produced from the finest woven cotton. This is extremely hard work and was probably one of the main reasons where the saying 'elbow-grease' originated from. The oil-based stains known as 'tints' are applied using a combination of double bladed metal scrapers and soft foam pads placed on a buffing machine. Each floor we stain is individual in its own right and cannot be copied, because every wood floor contains its own patina which will create a different colour when stained. There are many different types of Wood Floor Stains on the market from all over the world and the best we have found are from Denmark, Germany, France and the UK. The Floorfixer team has trialed many 'trade' brands only available to flooring professionals, and have come to the conclusion that they all have their own unique benefits which are suitable for different species of timber. With this in mind, we select what we consider will produce the best outcome for each particular floor only after actually sanding down to the bare wood. Floor stains stocked by the large chains of DIY shops are manufactured more like paint and do not enhance the grain of the wood, usually producing very unsatisfactory results. In fact, clear finishes sold in these places usually contain nitrocellulose and are well known for 'yellowing' over time. The cellulose part of nitrocellulose is manufactured from cotton linters (the small fibres attached to the cotton seed after ginning the long strand cotton balls). Cotton comes in many grades from white to yellow, but will always turn amber when exposed to UV sources no matter how white they may look in the can. If you have a perfectly good natural wooden floor, our advice is to keep the natural colour as it is and spend your money on something else. Dark or even white floors may appear trendy and dramatic, but they have some real downsides that you should consider before you spend your money. They show pet hairs and every speck of dirt and dust, whereas natural light coloured wooden floors are timeless and will never go out of date whatever the current fashion trend is. You don't have to have all the other wood in the room matching anyway. If you prefer darker woods or a white appearance, you could have most of the furniture darker or painted white, because contrasting lighter and darker woods tend to look very good together. It is also best to keep in mind that wood darkens with age, and that the natural look you start with, will not always be the same as the natural look you end up with over time. Most importantly for all wood floors - natural clear finishes wear very well and they don't show scrapes and scratches as easily as a stained floor. Going darker and making the wood pretend to be something it is not, will make your room space feel smaller too. Lighter wood reflects the light and will make any room look a more spacious, warm and pleasant place to live in. The natural wood colour is also more traditional, so less likely to seem dated in the future. Floorfixer technicians have the necessary skills required to provide an acceptable appearance, but it takes a really deft application of wood stain to make a wood floor even come close to looking like being natural.